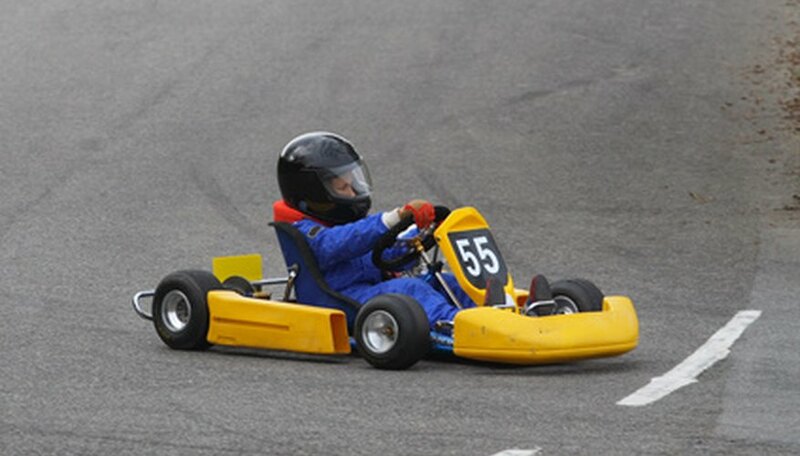 Whether it is for kart racing or simply for go-karts around the home and local tracks, building a go-kart is a pastime enjoyed by many individuals across the nation, particularly those who are interested in pursuing a career in motorsports. While the professional levels of the circuit use high-powered engines, the most basic go-kart engine is nothing more than a lawnmower engine that has been taken out of the lawnmower and repurposed for a second life as a go-kart engine. Building a go-kart requires a fully stocked garage and working knowledge of engines, as well as basic engineering and mechanical skills. Construct or purchase a go-kart frame. Ensure that your chosen location for the engine is large enough to fit whatever lawnmower engine you have in mind. Adjustments can be made using a cutting torch and angle iron with a welder, but always remember that the more weight on the frame means needing heavier material for the body, which adds to the weight and cost. Mount steel brackets on the body of your go-kart and use bolts to mount the lawn mower engine to the go-kart frame. Use wrenches or sockets according to personal preference. Ensure that you position the drive shaft cog so that it can be easily connected to the axle cog for the go-kart. Weld the engine in place if you are making a custom frame. Connect the sprocket drive system together, including the double-flanged hub, wall pipe, wheels, sprockets, brakes and axle. Ensure the brake drum and band (either your own or those that came with the kart body) are bolted onto the axle. Install the sprocket and the flanged hub before working on the tires. Ensure all the connections and bolts are tightened firmly with a socket or wrench. Thread and connect any electrical wires and connections to the pedals from the throttle so you can control the speed of the go-kart. Finish wiring the vehicle and install any corresponding belts or pulleys (depending on the type of lawnmower engine you chose). While socket sets and wrench sets are easily obtainable, many of the other tools required to mount an engine on a go-kart are specialized and require adequate training. For ease of use, purchase a pre-fabricated go-kart frame and use the manufacturer suggestions as for type and size of motor. In addition, there are limitations when it comes to using an existing lawnmower engine, since these engines are effectively on their second life. Customization of the frame may be required to ensure that the engine is mounted upright so the drive shaft and other components can be hooked up together safely. The use of a cutting torch and welder should be reserved only for those qualified individuals who can operate such machinery. Always wear the appropriate safety gear when operating power tools, such as cutting torches and welders.